I'm too pretty to do homework so my brother has to do it for me! 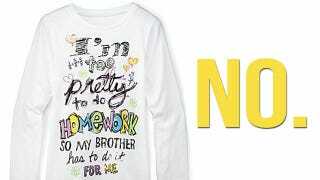 Just in time for back-to-school, JCPenney is selling a girls' shirt emblazoned with the slogan, "I'm too pretty to do HOMEWORK, so my brother has to do it for me." Isn't that a nice, positive message to send to girls aged 7-16? (And on sale, no less — destroying your daughter's self-esteem previously set you back $16.99!) In case your little lady-brain can't quite fathom the point, the page itself is titled "Girls 7-16 Too Pretty to do Homework" and the product description asks, "Who has time for homework when there's a new Justin Bieber album out?" Perhaps not since the launch of Teen Talk Barbie ("Math class is tough!") have we seen a mass retailer market a product to girls that so explicitly associates intelligence with being a boy, and looking pretty with being a girl. Perhaps worst of all, the graphical elements of the t-shirt that seem to represent "homework" are all mathematical — fractions, and the equation 4 x 6, which is, apparently to girls, one big "?". But why worry about homework when you can be pretty? School work — that's boy stuff! Never mind the girls who like school, who derive a sense of accomplishment and self-esteem from acquiring and mastering new information and skills. They probably only have to do that because they aren't pretty, the poor things. Girls already grow up surrounded by advertising that overwhelmingly sends the message that the most important thing about a woman is her looks. The average American reportedly sees 3,000 ads per day. JCPenney is telling girls that being smart is incompatible with being pretty and society is telling girls that being pretty is the most important thing on earth — for a woman. Perhaps the t-shirt and its slogan — and the equally cringe-inducing web copy — didn't raise any red flags at JCPenney precisely because these intellectually crippling messages about girls and their role in this world are so ever-present, so firmly established. We've reached out to JCPenney to ask about this shirt, why it was approved for sale, and why JCPenney thinks that "I'm too pretty to do homework, so my brother has to do it for me" is an appropriate message to send girls aged 7-16; we'll update if and when we hear back. UPDATE: It looks like that shirt has been taken down, but here's another one with a message that's just as healthy. The Girls 7-16 Best Subject Screen Tee lists "the subjects I TOTALLY ROCK at!" Which are, in order: Shopping, Boys, Music, and Dancing. On sale for just $4.99, folks.